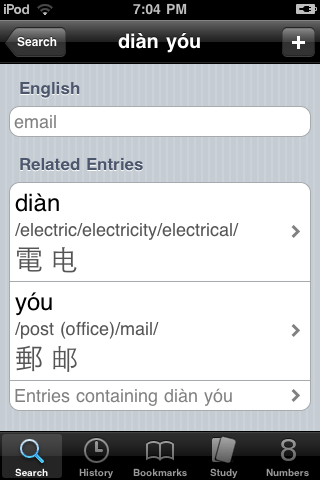 By popular demand, the next release of DianHua Dictionary will include Word Decomposition. As you can see in the screen shot below, the definition page now includes entries for all of the components of a word. You can touch any of these entries to go to their definition pages. Also, notice the “Entries containing…” option. It will search the dictionary for any entry that contains the displayed entry. Both options can be incredibly useful when reading something that has words you don’t yet know.